At around 5 p.m. on Tuesday, the NYPD Bomb Squad cordoned off First Avenue near the L train station on East 14th Street and the station itself after getting a 911 call about a suspicious package. However, by 5:40 p.m., the NYPD gave the all clear. As for what the package, which had been seen under a bench on the southbound platform was, a spokesperson for the department said he didn’t know other than “It wasn’t a bomb.” The photo, taken by Stuyvesant Town resident Henry Beck shows a traffic-free First Avenue at around 15th Street at 5:30 p.m. today. An Alphabet City teen who’d been missing since Friday, September 19, has since been found and is in good health, police said. An announcement was emailed by police after midnight on Tuesday. 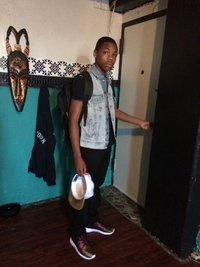 Last week, a missing person alert was put put for fourteen-year-old Jamancey Vadon of Riis Houses on Avenue D.
Police are looking for a man who was last seen strolling out of Bellevue Hospital on the afternoon of Saturday, July 5. Elliot Baez, 57, is 5’8″ tall, weighs 150 pounds and has brown hair. He was last seen wearing a blue dress with yellow flowers, yellow socks and black sneakers. Anyone with information is asked to call the NYPD’s Crime Stoppers Hotline at 800-577-TIPS or text tips to 274637(CRIMES) then enter TIP577.